Yes, Monday’s meeting on November 17th at 7.30 is all about the art of sugarcraft. We’re delighted to welcome Mandy Hurd who’s going to teach us how to decorate cupcakes using butter cream and sugarpaste. This is a hands-on meeting, so bring an apron and a rolling pin if you have them. Apparently smaller rolling pins are best. You may also want to bring a box or bag to take your decorated cakes home. Our thoughts are turning to Christmas crafting this month. Yes, yes I know, but it’ll be here before we know it! For our meeting on Monday 20th October, we’ll have four exciting Christmas crafts for you to try. There will be buttons, felt, paper and clay to play with and you can move between tables or concentrate on learning one new technique. August’s meeting was a blast. 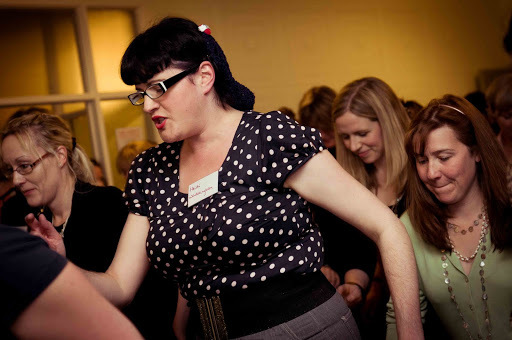 Unfortunately our planned vintage hair demonstration was cancelled after our demonstrator let us down at the last minute. So it was Google to the rescue – our president downloaded a couple of pub quizzes and we snatched victory from the jaws of defeat. 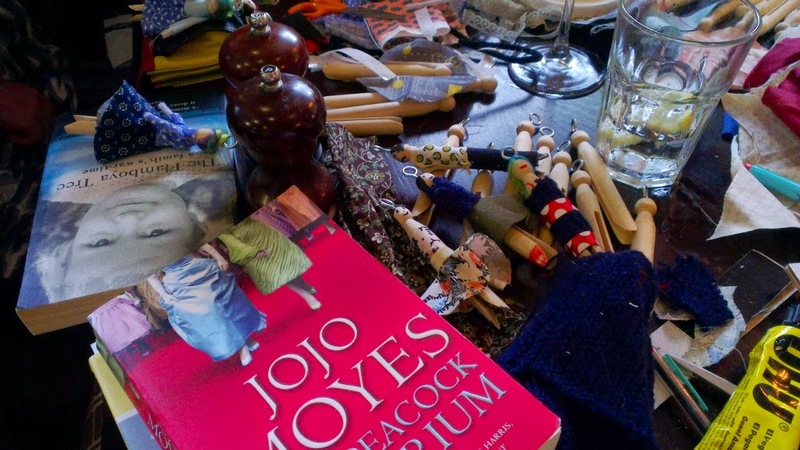 Book group this month was hijacked by peg doll people. 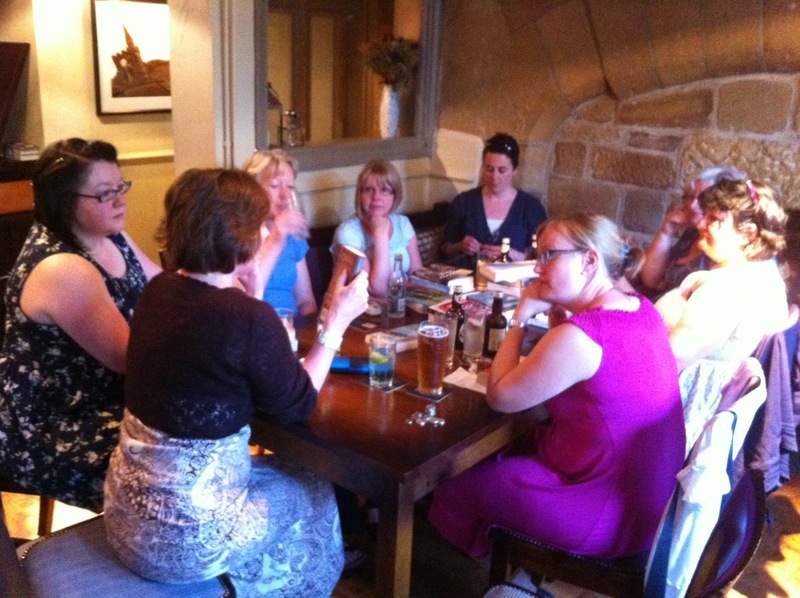 The Book Group meets once a month, the Monday after the WI meeting. We usually meet upstairs at The Old Gate, Hebden Bridge at 19.30. The meetings usually last about an hour to two hours depending on how much chat goes on, but it is all quite flexible and informal. The group works on a swap system where we bring books recommend, or not for others to take and try. Books are either returned to their owners or taken to Overgate charity shop once finished. There is no need to finish the books by the next meeting, and we have all tried books we would not normally have picked up. Our new President, Caroline Burton, can be seen here on the far right. 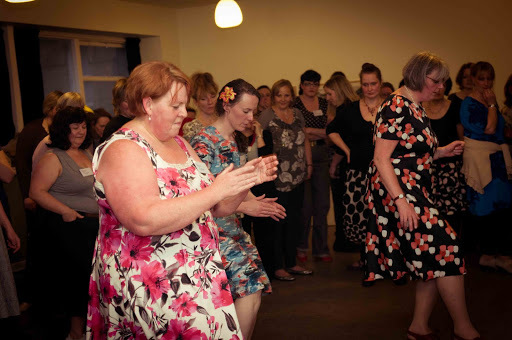 We’re very pleased to announce that Caroline Burton is Hebden Bridge WI’s new President. 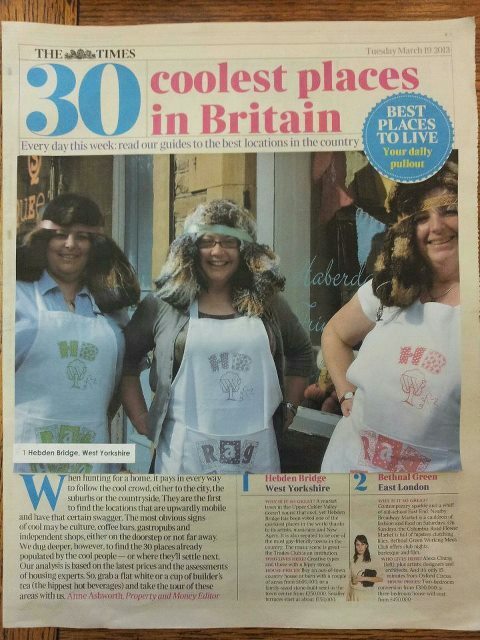 You can see Caroline in the photo above, proudly sporting her Hebden Bridge WI Rag Hag apron and, erm, the delightful handmade head garment… cough. 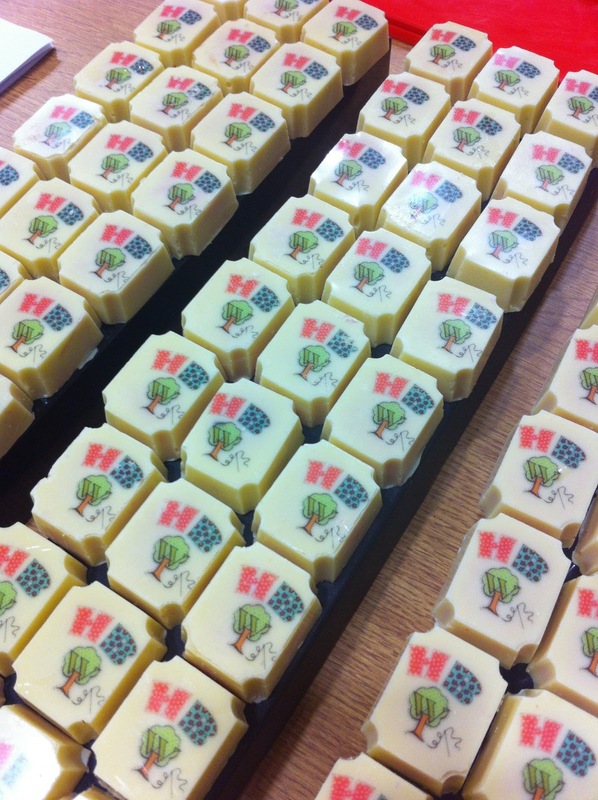 Shabby Chocolat made us our very own Hebden Bridge WI chocolates. They were delicious. Thank you to all of you that have led and participated in these meetings and create the atmosphere that means we keep turning up each month to learn new skills and meet new friends. You’ll be pleased to hear we raised £494.30 for Overgate Hospice in 2012. We hope to do something similar for Living Well, our charity in 2013 by raising money and collaborating with them. Thanks to everyone who has brought a fabulous selection of edible treats over the past 12 months. And thanks to all of you that came to meetings to eat them. The textile committee have organised 2 very successful rag markets under the guidance (and hard work of) Vanessa Kay. Last summer we saw our first 2 day Rag Market and despite its timing the weekend after the first flood it was yet another success. 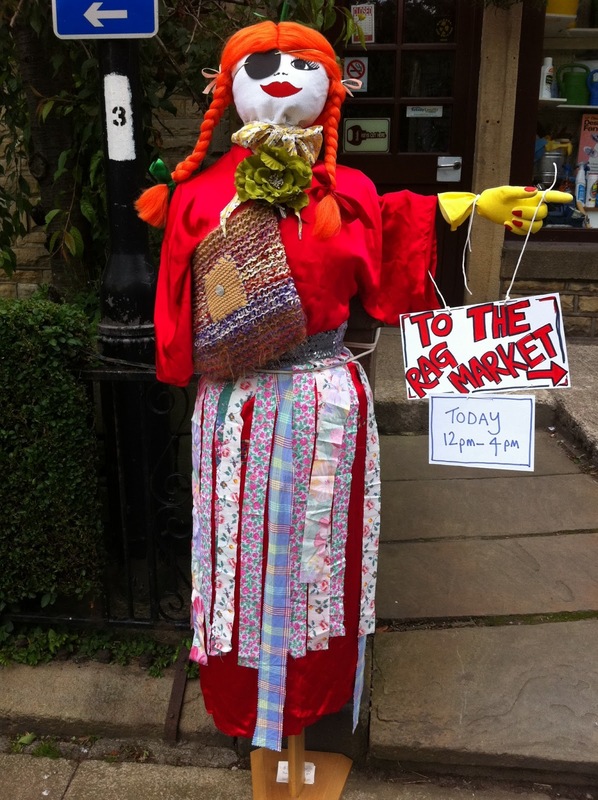 We’ll be having another 2 day rag market this summer and a one day event in autumn. The rag markets are our main fundraising stream and this income has given us the opportunity to offer members of the group a £500 bursary to undertake study. We’ll be offering another bursary this year for members, so here’s your chance for studying something that interests you with the help from this group. 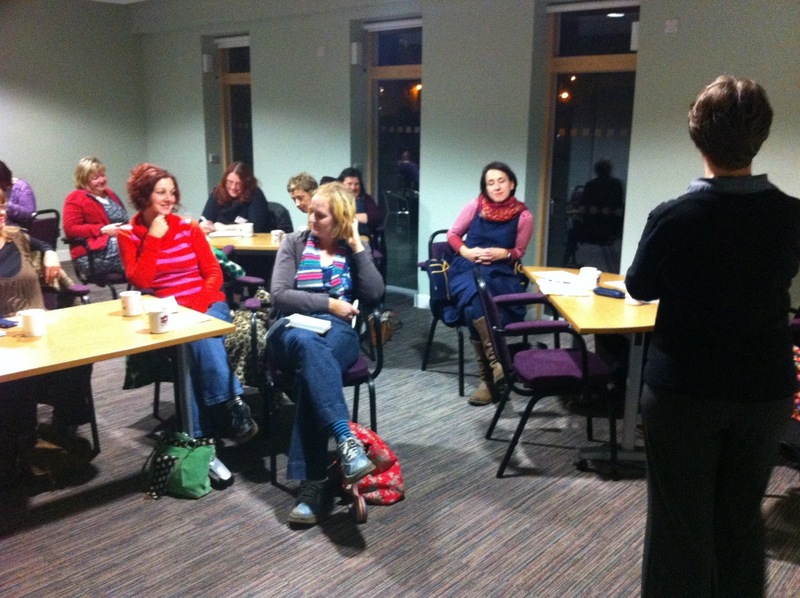 We have sub committees, other than the textile group, that meet regularly and irregularly. 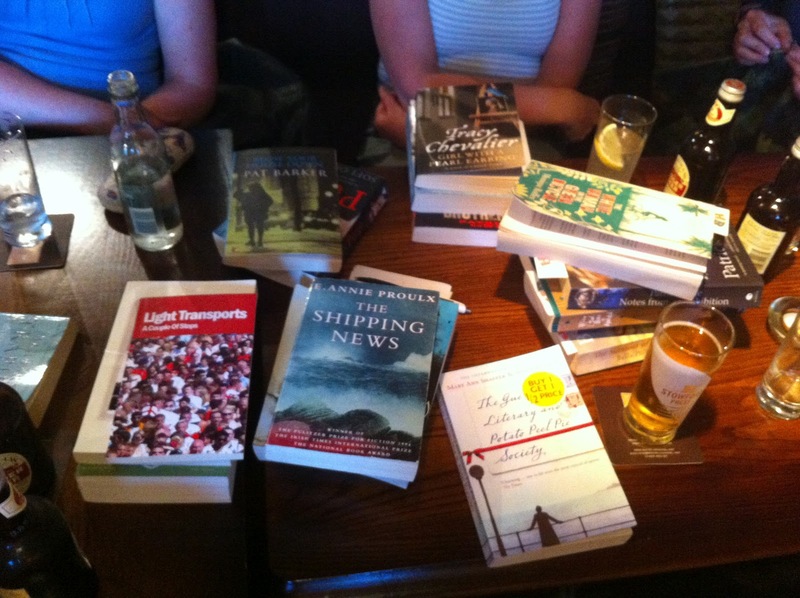 These are the book swap, the walking group, the film lovers, and the art lovers. In the last 12 months we have added the badminton group and there’s the brand new ukulele band. 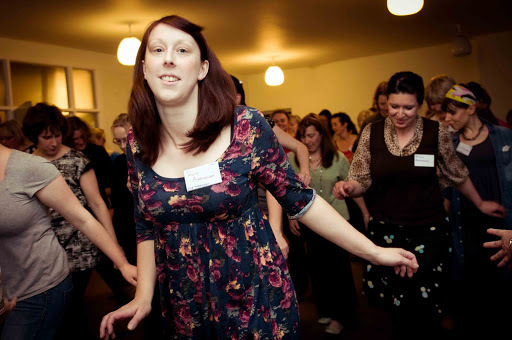 All members of Hebden Bridge WI are invited to join in with any of these groups at any time. We let you know about dates and times on our Facebook page and on our blog. We met this month in The Old Gate upstairs. It was quite quiet upstairs so we did not disturb anyone. We can be a bit loud! Again loads of books either coming back or new to the group. A huge pile in the middle of the table. Janine brought back Patrick Gale “Notes from an Exhibition” having struggled with it, although lots of us liked it lots. A A Gill “is away” brought by Cheryl. Although the author is not that likeable the book was good. Cheryl also returned “Fifty Shades of Grey”, most people who had read some or all of it agreed that it was badly written and not that interesting. “The behaviour of moths” by Poppy Adams really interesting & different, but recommended. Katie really disliked “the Sea” by John Banville so much so suggested no one should borrow it as would be a waste of time to read it. She also read “Stonemouth” by Iain Banks which was interesting, readable and quite funny. 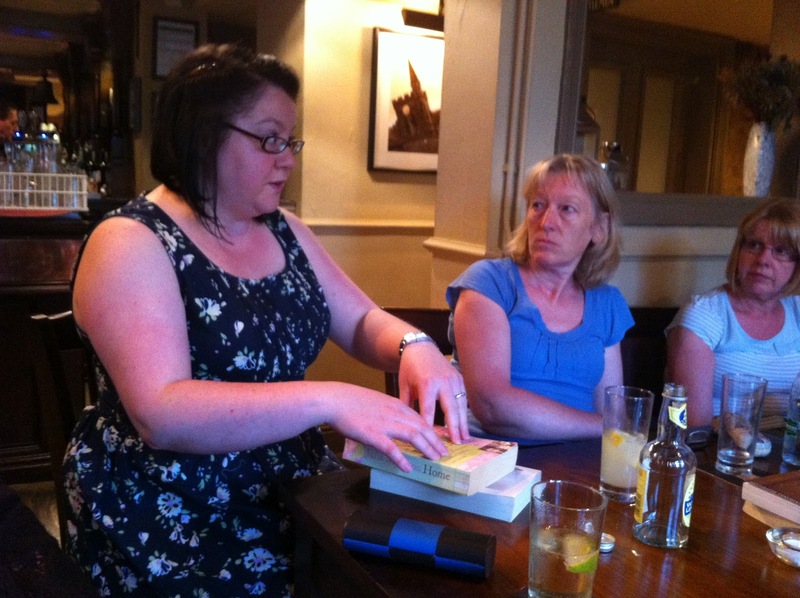 Kirsty brought along three zombie books which are also thrillers and full of political intrigue. This will be reviewed next time. In January 7 members of the book group met up with piles and piles of books between the, as it had been two months since the last meeting. Jen took away 5 books in the end with lots left on the table that she would like to read, and still had time to write this! Linda Green ’10 reasons not to fall in love’. A good read. Linda came to talk to us so we were all keen to read this one and it is based in Hebden and the Valley. Both Margaret & Sue brought the same book: Lisa Genova “Left Neglected” about a woman’s interesting & difficult medical condition. Kirsty brought a series of five books set in a Victorian steam punk world by Gail Carriger. She started with one at Christmas and since then has bought & read all five – they must be good. Jane Gardner’s “the man in the wooden hat” a very engaging story set very much in a previous colonial age. A love story with many twists. P.D. James’s “Death comes to Pemberley”. Showcased as a sequel to Pride & Prejudice and to make sense of it you do need to be familiar with the story as the characters relationships developed so well in Jane Austens classic are taken for granted in this book. Entertaining but felt it was a little unbelievable and trying to be too clever by half in places. Pride & Prejudice is a classic that we found we all loved, very apt on its two hundredth anniversary today. 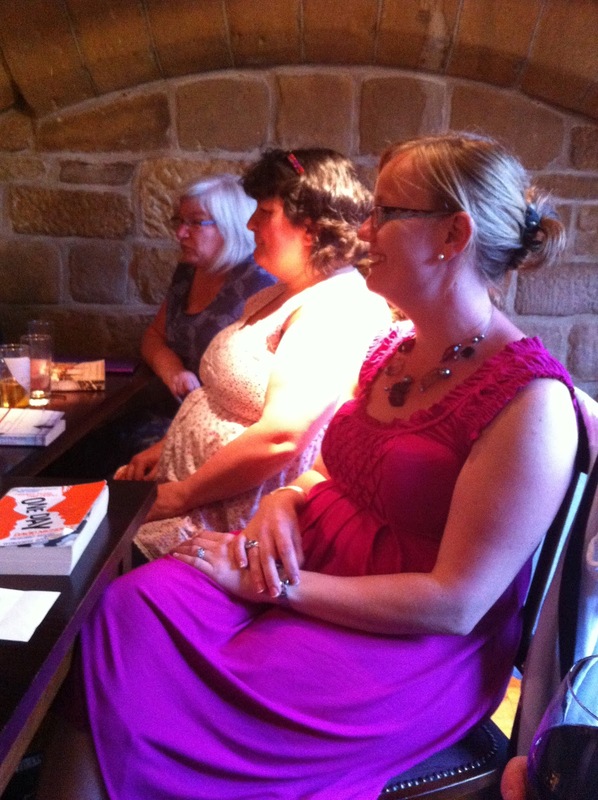 Next book group will be Monday 25th February 19.30 White Lion, Hebden Bridge. 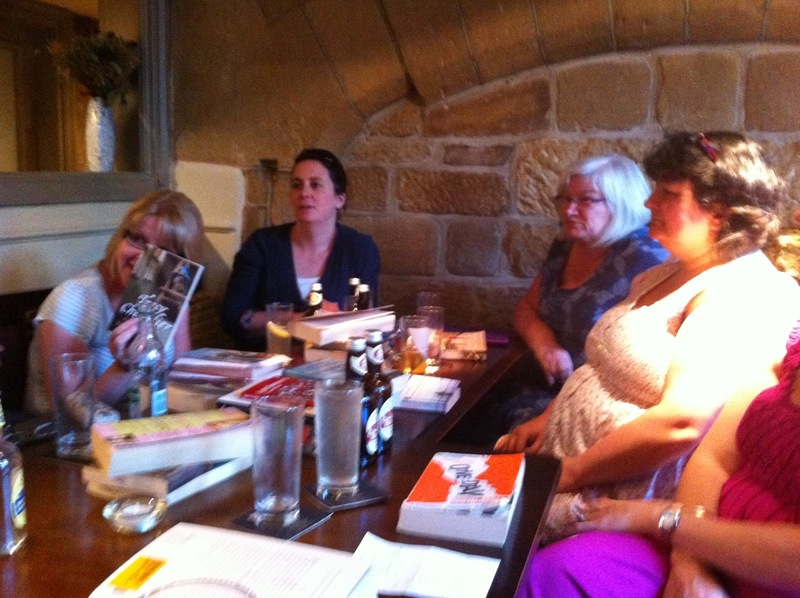 The Hebden Bridge WI book swap meet once a month in The White Lion to discuss recent reads. The group decided they didn’t want their meetings to cause stress, so rather than everyone reading the same book and then discussing it, everyone brings a book they’ve enjoyed (and sometimes a book they haven’t), presents it to the rest of the group and then offers it for anyone to take home and read at their own pace. 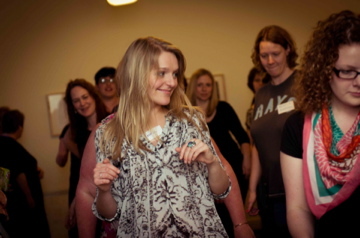 This method is gaining momentum and the group has got into it’s stride with plenty of swaps taking place at each meeting. Any spare books are donated to the Overgate Hospice shop, giving a little extra to our charity of the year.